Enter your e-mail address below to receive electronic notification of upcoming events! At some time in our lives, most of us will be faced with the need to liquidate personal property. Perhaps you need to sell some of your own belongings in preparation for a move to another city or into a smaller home. If there is real estate to be sold, its contents may need to be removed quickly so that the property can be shown for sale. You or a family member may have decided that it is time to move into an assisted living facility or nursing home. The sale of a home and personal property can be an important and welcome source of funds to help with the cost of care. Perhaps you have been designated the executor or trustee for the estate of a family member of friend. At this emotionally difficult time, you will be asked to make important decisions about the disposition of the person's property. To fully understand the legal responsibilities that come with this role, you may wish to contact an attorney for advice. It may be necessary to have an appraisal of the estate done by a certified professional. You may have inherited a house filled with the accumulation of several generations, and be feeling overwhelmed by the task of sorting through and disposing of the things you do not wish to keep. This may be too physically demanding for you, or you may not have the time to clean out the property. Too many times, people in situations like these decide to "have a garage sale" to dispose of their things because they do not know what else to do. Unfortunately, a garage sale is the worst way to dispose of property if the owner does not have a full understanding of the value of the items to be sold. Too many times, valuable items are sold far below their value, and low value items remain on the tables at the end of the sale because they were overpriced. Where can you turn for help to receive the most money for your things in a way that works for you? 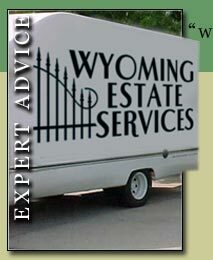 For many years, Wyoming Estate Services LLC has provided expert advice during this confusing and often difficult time. In a free and confidential consultation, we will listen to your concerns and needs. We will provide you with options for disposing of your personal property, and help you choose the option that will best meet your needs. Contact us today for a free consultation to find out how Wyoming Estate Services LLC can help you!